What is it about bamboo rods that continues to have such allure after all these years? By many measures, it makes no sense, really. 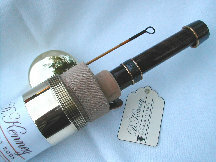 It was elbowed aside by technology long ago as the requisite raw material for fly rod construction. Yet bamboo endures. As a material, it is difficult to work with. It requires time, patience, intuition, instinct, skill, finesse, experience, and a bit of magic to turn a culm of bamboo into a fine fishing instrument. All are qualities that seem wholly out of step with the dynamics of instant gratification and market-driven merchandising so prevalent today. "Bamboo, being a natural product, like flesh and blood, can establish a greater affinity with its owner than with any other material. There can be a powerful personal bond between them, an identification, that lets the caster feel that the rod is an extension of his own personality. It goes beyond mere pride of ownership." "Building a rod that provides you with that "powerful personal bond," is what it is all about for me."